Manufacturers used to rely on retailers to distribute their product, but today more companies are selling their products straight to the end users. This direct-to-consumer (or “D2C”) approach has built unknown startups into household names almost overnight—and Purple’s online mattress store is a prime example. They invented a comfy mattress that they ship to your door in a box. It’s hard to log into Facebook without seeing yet another zany video ad for the Purple mattress. But while they’re known for their attention-grabbing ads, you might be surprised by how they’ve been (quietly) growing their organic search traffic, too. Casper is still the market leader in the mattress startup game—they projected revenue to be about $370 million in 2018, while Purple reported $285.8 million. But when it comes to SEO strategy, Purple is the one to keep an eye on. In the past year, Purple’s estimated monthly organic search traffic jumped by about 84%. 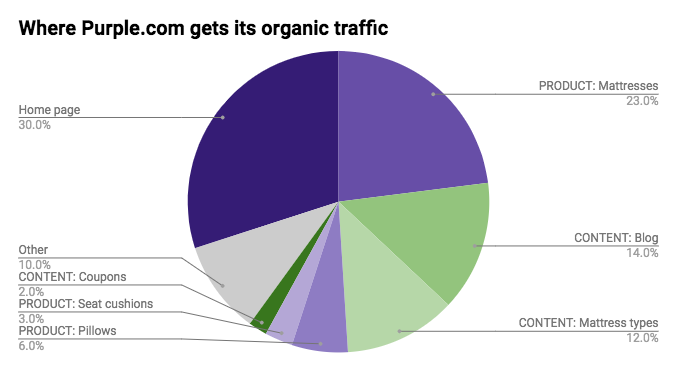 On the other hand, Casper’s organic search traffic slowed by about 8% from March 2018 to March 2019. And having a solid organic strategy is smart for Purple—because the PPC market is super competitive. The more traffic they have flowing to their website organically, the less they need to spend on getting people to their website from search. But get this: people Google “purple mattress” nearly 400,000 times a month. That’s right: there’s more Google search for the Purple brand than there is for the generic name or product category! This is where we see some of the long-term returns of smart advertising. By building a memorable brand, Purple got people to Google them long after seeing their ads and commercials. 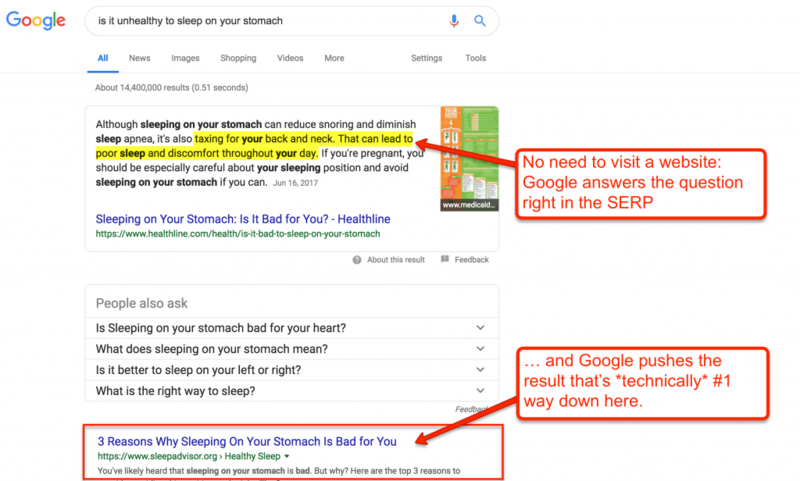 One of the biggest problems that publishers face today is Google’s cannibalization of search engine results pages (SERPs). There was a time when Google rewarded the best content producers with traffic. The better your content was, the higher you ranked. And the higher you ranked, the more traffic you got. But now we’re seeing a shift. For an increasing number of SERPs, Google reserves the top positions for itself. And the better your content is, the more likely it is that Google will scrape snippets of your content to present to searchers—so they never have to visit your website. So, for example, even if you worked hard to rank #1 for a question like, “is it unhealthy to sleep on your stomach,” you might not see much traffic from it. It used to be that you were competing with other content publishers. But now you’re competing with Google itself. So what can you do to offset this? People are still going to use Google to find things online. So even as Google keeps up their shenanigans, a smart way to still be found is to build a brand that people search for. If you’ve been listening in on SEO chatter, you know that Sparktoro’s Rand Fishkin has been sounding this trumpet for a while now. He gave a swell talk on the matter in March 2018, and has shared this tidbit on Moz’s Whiteboard Friday. The idea is that even if generic keywords taper off in search volume (and Google gobbles up traffic from those searches), you can mitigate that decline by growing more searches around your brand itself. Essentially, search marketers need to be thinking about creating demand, not just meeting it. Purple did this via a constant stream of memorable (and fun!) ads over the past few years. This may be the #1 easy tip that anyone running an ecommerce business can implement. When we looked at Purple’s most valuable SEO pages, we found a lineup of unsurprising content: the homepage, the product pages, some very popular content marketing pieces, etc. But number eight caught our eye. Data source: Ahrefs. “Value” = the estimated amount you’d spend to get equivalent traffic via AdWords. Turns out one of Purple’s most valuable SEO pages is a simple signup form telling people how to hear about coupons and discounts. When people are going through checkout, they’re prompted to enter a coupon code, discount code, promo code—you get the idea. For some shoppers (like me), that hits pause on the entire purchase. They immediately Google “[PRODUCT] coupon code” and start sifting through a bunch of dud results on RetailMeNot—or just lifting the code from an affiliate site. So … if people are Googling coupons and promo codes, wouldn’t you rather they get them straight from you? 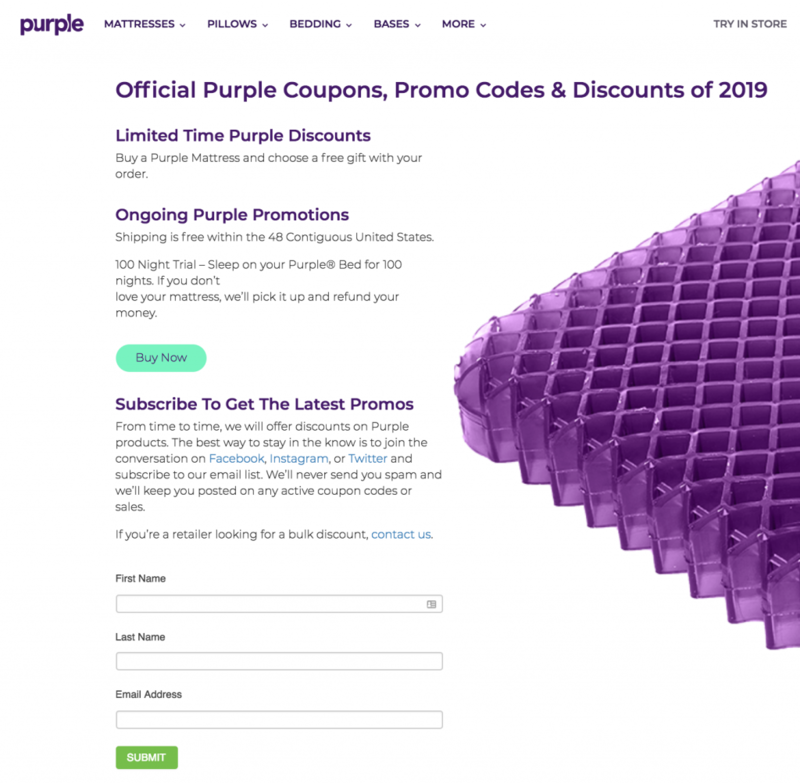 Now, Purple’s coupon page isn’t the greatest satisfier of search intent—they don’t list actual coupon codes like Squarespace and Logos (way to go, you two). But they do invite people to join their newsletter to hear about exclusive promos and discounts later on. And it’s a h*kk of a lot better of an experience than RetailMeNot. If you run a direct-to-consumer brand, I’d highly recommend having a page dedicated to helping those thrifty shoppers find discounts. 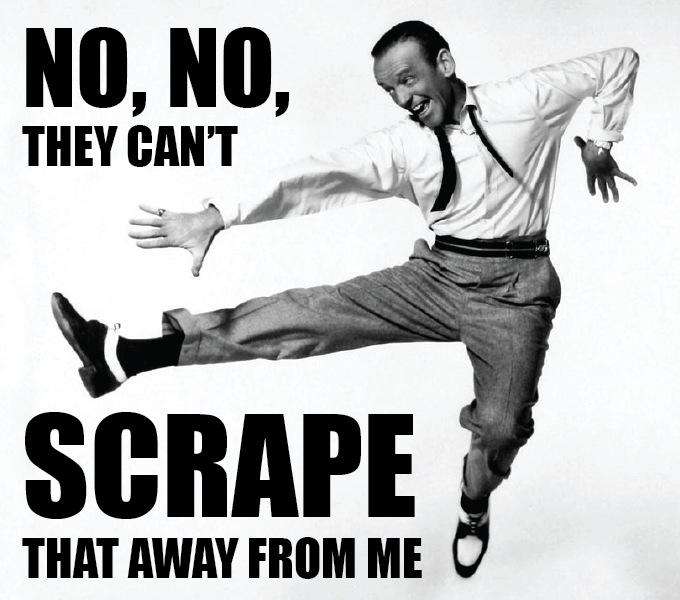 They’re going to look for it anyway—you might as well capitalize on that opportunity to build goodwill. 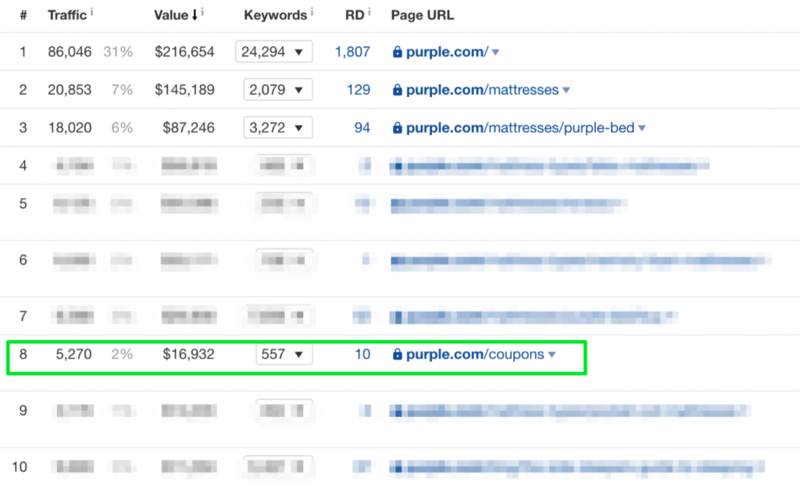 About 12% of Purple’s organic traffic goes to a small section of their site devoted to different types of mattresses—mostly mattress types that Purple doesn’t even sell. In fact, the average blog post gets about 280 organic hits a month. The average mattress type page gets more than 3,000! That traffic itself is almost 3 times as valuable as the blog’s traffic! This is the second-most-valuable subfolder of Purple.com, and it’s the third-most-visited. Here’s the thing though: only one of these pages is about the Purple mattress. Everything else here educates folks on the other kinds of mattress out there. That’s smart, because if someone’s Googling “waterbed,” or “futon mattress,” they might be in the market to buy a mattress. By capturing this traffic, Purple gets a shot at introducing their type of mattress to these folks. Plus, they can retarget the h*kk out of them with ads for better mattress options. Purple’s mattress type guides aren’t very in-depth, but they are very well-linked. Each page is linked to every other page in that section—which is something Purple can get away with, being that the purpose of the section is to educate people on various mattress types. It’s not rocket science, but I’m surprised by how difficult it is for brands to consistently maintain an internal linking system for their content. This is one of the advantages of the “Kit Calendar” approach to planning content—all your articles and links are pre-planned! It’s tempting to make big attention grabs with the blog—or to just pump it full of testimonials and press releases. But in terms of SEO, the blog posts that win are the ones that answer questions or solve problems for your audience. Purple’s a good example of this. They’ve published almost 130 blog posts at the time of this report, but ten of their posts account for about 80% of the blog’s organic traffic. The titles pretty much say it all: these posts are all about answering questions and solving problems. What Kind of Bed Foundation Do I Need? Is A Bunkie Board The Same As A Box Spring? If you’re in the direct-to-consumer business, there’s a lot you can learn from Purple’s approach. These tips can be put to use in just about any D2C vertical. They’re working for Purple; they can work for you, too.